However, these “crimes” for average citizens are things that police officers will not arrest each other over and often times can get away with. Moreover, as we have shown, police officers have a far greater rate of domestic violence and sexual misconduct than the average population. Another stereotype-shattering number the study found was that these concealed carry holders aren’t just white conservative males “clinging to their guns.” In fact, the numbers show that women and minorities lead the pack when obtaining permits, by a long shot. According to the study, between 2012 and 2018, the percent of women with permits grew 111% faster than men and the percent of blacks with permits grew 20% faster than for whites. Permits for Asians also grew 29% faster than for whites. Sadly, these innocent, law-abiding concealed carry holders who have dark skin are not safe from police who fear guns. As TFTP reported at length, Philando Castile lost his life for legally conceal carrying a gun. He is joined in his death by Jemel Roberson and EJ Bradford who both stopped mass shootings with their legal guns late last year only to be gunned down by police who showed up after. It is also important to remember that there are now 14 states who do not require citizens to acquire concealed carry permits to carry. Because of these constitutional carry states, the number of those carrying concealed is likely higher. On top of concealed carry permit holders committing far less crime, the study found an inverse relationship between violent crime and concealed carry permits. 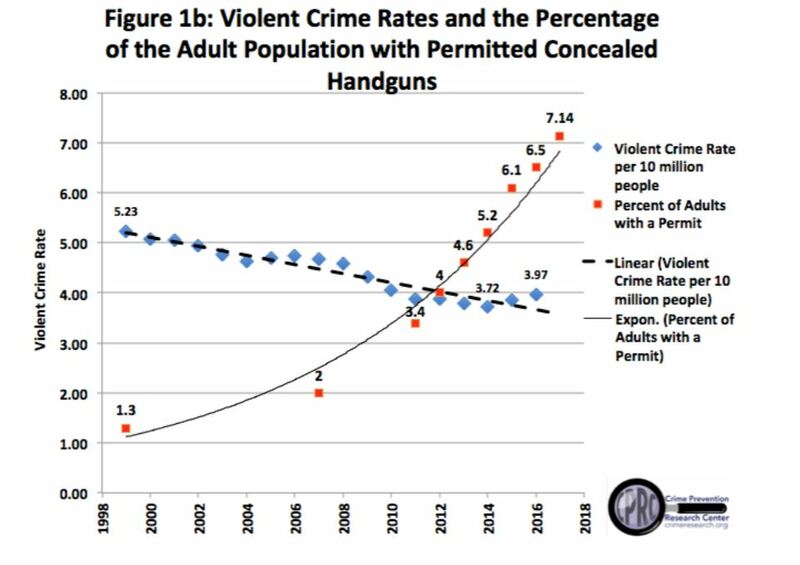 As the number of concealed carry permits goes up, the number of violent crimes goes down. By contrast, when we observe areas with stricter gun laws, like Chicago, their crime rates move in the other direction. Given these numbers, the idea that stricter gun laws will prevent crime becomes sheer insanity. Yet still, politicians from across the country are creating and passing legislation on a massive scale. Unless you’ve been under a rock lately, then you’ve likely seen the unprecedented push by all levels of government to separate law abiding Americans from their guns. No, this is not some conspiracy theory either, as TFTP reported this week that there have been thousands of guns confiscated from law abiding citizens under these new red flag laws in just the last year. The president himself ushered in a new level of gun control last year doing what his liberal predecessor even refused to do by banning bump stocks. However, the good news is that as states across the country seek to limit the ability of innocent people to defend themselves, people are disobeying. Indeed, as we’ve noted time and again, rights are preserved and gained when good people make a stand and refuse to obey bad laws.